What you get with this phone is an Eseries device with a very comfortable keypad. That probably is enough to put a broad grin on a heavy texter's face. There are four message editors on-board: SMS, MMS, audio and e-mail. The SMS editor is the well known intuitive application from the last few versions of Symbian S60. It has a counter of the characters left to the limit of 160. There is also an indicator in brackets showing the number of separate parts the message will be divided into for sending. The audio message, albeit technically a type of MMS, has its own editor with simple and easy to use interface. It can either record the message on the spot or use a previously recorded sound clip. Email is the highlight in the Nokia E66, as it supports a wide range of personal and corporate email standards such as Microsoft Exchange, Gmail, Yahoo! Mail, Hotmail, Nokia Intellisync Wireless Email solution, along with System Seven and Visto Mobile. Encryption is also on board, as well as mobile VPN support for connecting to secure corporate Intranets. It seems Nokia has got everything covered except for Blackberry Connect support. Nokia claims that since they are offering their own push email service similar to Blackberry Connect, they are now direct competitors and, as such, they would no longer offer Blackberry Connect support. It's a decision, which clearly shows that selling their email service to end customers is more important to Nokia than selling their handhelds. While this may sound perfectly reasonable to Nokia marketing department, it might make a few potential E66 buyers change their minds. Anyway, Nokia have added the ultra easy email setup. If you are using any public email service (it has to be among the over 1000 supported providers), all you have to do is enter your email address and password to start enjoying emailing-on-the-go. Nokia E66 takes care of downloading all the relevant settings to get you going in no time. The client can download headers only or entire messages, and can be set to automatically check mail at a given interval. There is also support for attachments, signatures and basically everything you can think of. Push email support is also on board, so we can hardly think of anything the E66 lacks in this department - except for the BlackBerry connectivity. As a whole, Nokia E66 is a great texting device. It has very good typing ergonomics and good software coverage and that are basically the most important things you need. Of course it can't compete to the QWERTY-enabled E71 (let alone the Nokia E90 and other similarly sized devices) but again - it was never meant to. The E66 is a phone you can comfortably slip in your pocket, and it still does more than a good job. Normally one wouldn't expect a business-minded handset such as the Nokia E66 to have really fancy music features. In this case they'd be wrong: the music player is as good as Nseries, dubbed the multimedia flagships. Not that it costs Nokia much to put the time-proven Symbian S60 music player but it earns a point for the device nonetheless. There is a huge number of audio formats supported including MP3, AAC, eAAC+ and WMA. M3U playlists are also managed seamlessly and transferred files are added to the music library trouble-free by choosing the refresh option. Furthermore, upon completing a USB transfer, the phone automatically prompts scanning for new music tracks and, if allowed to do so, adds the new ones to the music library. Filtering tracks by artist, album, genre and composer is automatic and searching tracks by gradual typing is also at hand. This can turn out really useful if you have a really huge music collection uploaded to your E66. The player comes with five equalizer presets and stereo widening effect. You can also create new equalizer presets if the preloaded ones won't do. Finally, Nokia E66 also includes support for the A2DP Bluetooth profile, which allows listening to music on a Bluetooth stereo headset. 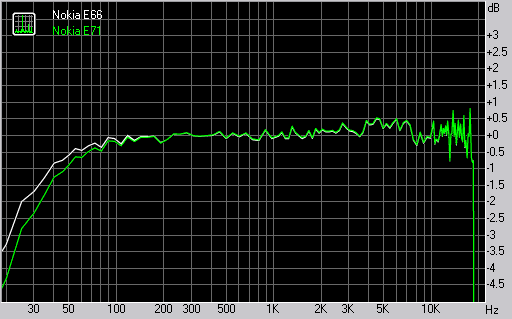 Even if music is not a high priority, Nokia E66 has a rather good frequency response. However the rest of the readings in our audio quality test aren't really impressive. There is nothing too disturbing but still most of them are slightly below average. Given the business targeting of the device and the fact that we've seen Nokia do even worse, we would call the audio quality of Nokia E66 acceptable. Here are the results so you can see for yourselves.